Everyone is ok–some friends ended up with trees on their houses, one lost all her trees in her yard, one is banned from his loft until the insurance company decides what to do, but everyone is alive and well. It stormed again yesterday afternoon, but no tornadoes (just hail and too much rain), and now it’s sunny and 64 degrees. Go figure. But sometimes you just need bread to make the storms go away. That’s my philosophy at least. Put warm water in a large bowl, and add sugar, stir until dissolved. Add the yeast next, and wait a few minutes for the yeast to dissolve. (The yeast feeds on the sugar, thus the bread must be made in this order. Next, stir in one cup of wheat flour and one cup of bread flour. 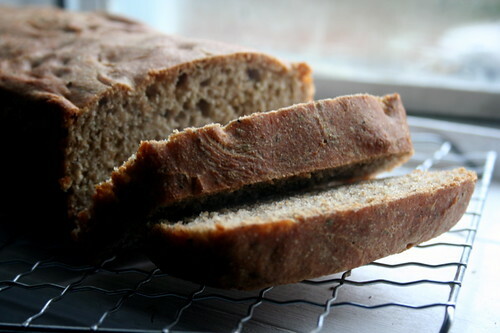 The wheat adds the nutrition to your bread, the bread flour makes it easier to knead. Add your butter at this time as well, and all the spices. Mix all this together, adding more flour as needed. The mixture should be somewhat stretchy, and not stick to your hands. Transfer the bread dough to a greased, covered bowl, and put in a warm place. We usually use the same bowl as was used to mix the bread, just removing the dough, greasing the bowl, and returning its contents. Let rise for one hour, then punch down and transfer to a greased bread pan. Let rise for another hour, and put in an oven preheated to 450. Bake for 10 minutes, then reduce the oven to 350 degrees. Bake for another 30 minutes, remove from the oven, and let sit for 20 minutes before cutting to serve.